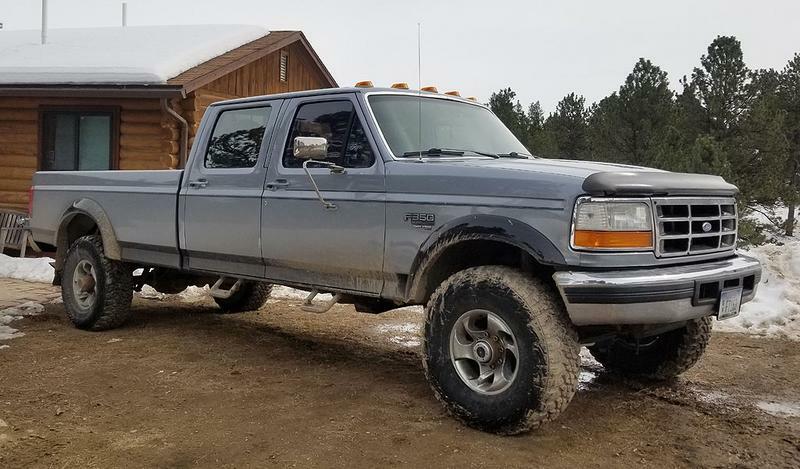 After drooling over my buddy's '97 F350 4x4 (automatic transmission) for over a decade, he finally agreed to sell it to me (and for $4,000!). It's in surprisingly good condition for 230,000 miles, but I find the power output to be rather dismal. My daily driver is a '16 Cummins powered Ram that puts out 900# of torque, literally double the power of this 7.3, and I'm used to actually passing someone when I try to pass someone. I need to increase the output of this 7.3 to get it in a reasonable power range. I don't need to get it up to 900#, but by modern standards this truck is a dog and I'm confident that it can do better with proper mods. I'm looking for a balance where I can get respectable power out of it without destroying the drivetrain. I don't want reliability to suffer, I just want to be able to accelerate reasonably when I attempt to pass someone. Having reasonable power available when I'm towing my tractor would be even better (around 10,000# total load). I don't want to replace the turbo until this one quits, and I'm considering upgrading the injectors and adding a tuner. For a tuner, I'm considering the Edge CTS2. I've used the Edge previously on Cummins diesels with great success and was planning to stick with what I know. Is there a "better" tuner for what I need? What about injectors, what injectors would you recommend and why? Are there any other potential mods that I'm overlooking that I should be considering? All you are going to get is 30-40 more hp out of any tunes or chips no matter what they advertise. To get more power you are going to have to change out your injectors, add gauges, possibly a inner cooler, transmission work, electric fuel and a few other things. Power does not come cheap. If you still are thinking about it forget about the Edge products, they are hard on transmissions. Do some checking on the PHP Hydra chip. Probably need to get rid of the restrictive stock downpipe as well. Can you recommend a specific replacement pipe? I looked on the Banks website but couldn't find anything. I'm honestly not even sure how much I need, I just know this ain't cutting it. For injectors I would go to RoseWoods 160cc injectors. You may or may not need to go with electric fuel with these. Then a PHP Hydra chip to run them. There are a number of outfits out there for a two piece down pipe. Banks is good but more expensive than it should be. Diamond Eye makes one that a lot are using. Then you can also think about getting rid of the cat or if you are in a area that has emission testing you can gut it, or knock the innards out of it and then put it back on. The stock 3 1/2" exhaust is just fine unless you really want to go larger. Once you have injectors you need more air flow. A DIY Tymar works quite well. It is a construction equipment filter. Or you can go with a Ford AIS which is a good filter for the money. You will also need gauges. Exhaust temperature and transmission temperature at the very least. Some like to throw a boost gauge into the mix so they can see just what they are pushing. Don't skimp on these or you will be replacing the cheap one with good ones. ISSPRO and Autometer are two of the best, I run ISSPRO. So so far you have spent around $2800 plus or minus a little. Now you need to start saving for a built transmission. The stock one is not designed for the HP or torque you will now be driving. Figure another $4500 for a good BTS or John Woods transmission. There are other things such as a better high pressure oil pump $500-$1000, electric fuel $400-$1600 depending how handy you are. I know that there are things that I am forgetting but just remember that HP is not cheap. Bugman and klhansen have it covered for you. Please fill out your signature line so we can get a bead on what you have to better offer advice. I'm noticing the tires from your photo, kinda wondering about your gearing. Electronic diesels have come a long way since '96; you're kind of comparing apples and oranges. The pickup I have (setup is in my signature line) has been on the ranch since Jan '95 and 1200 miles showing. It is worked like a dog, and gets the job done for me. I don't win races, don't haul my overloads to the coast, but have watched plenty of the newer Powerstrokes, Duramax's, and Cummins powered pickups come and go in the neighborhood but my old dinosaur keeps on rolling! Having said all that... get rid of the squished down pipe and the factory air box (I highly recommend TYMAR Performance). Those will let the engine breathe easier. In my case (almost always HEAVY TOWING), I refreshed my injectors but stayed with the stock flows (didn't want to add an intercooler) and added a TS flip chip. Somewhat better power for towing, MUCH BETTER throttle response when unloaded or empty. Thanks much for all of the information. I'm happy to report that I'm happier than I thought I would be with it's loaded performance. I hauled 450 gallons of water with it today and it wasn't any slower than when it was empty. While it obviously doesn't have the power of my Ram, the load just didn't affect it like I thought it would. I still want to open up the exhaust and get it free flowing, but I don't expect to mod it beyond that, at this point. Any exhaust recommendations? I looked at the Banks kit but it's designed to run the stock catalytic converter and I don't want to run a catalytic converter. I'll run the muffler, but not the cat. Montana doesn't have vehicle inspections so it's a non-issue here. Or I could run the Banks kit and just get a bypass pipe for the converter, if nobody makes a kit designed to bypass the converter. TYMAR Performance out of Spokane for the intake, and perhaps the downpipe. Not sure if you can get a "test pipe" from him to see if your cat convertor is working well or not... I got my exhaust from AFE. The stock exhaust is 3.5" going back, and the factory muffler is a straight-thru design. In hindsight I would've left mine be, didn't know the muffler was straight thru flow. Dale at TYMAR does not have a web site but he list his phone number as 509-922-8785 and will have everything that you need. In all reality the stock exhaust is just fine and there is no real need to go to anything else except to spend money. But I believe that he sells a complete 4" from the downpipe back plus he did have a 3" downpipe that went to 4" after the pinch weld. Another exhaust system that a lot use is Diamond Eye. They have a 4" turbo back but everyone complains that it is only 4" from the downpipe back. But that is just they way that they advertise it. The Banks stuff is nice but it cost twice as much as it should. You have to pay for all that research and development that they do.